While 2017 is winding down with volatility levels at historical lows, a calmness has remained in the market for quite some time. According to Fei Mei Chan, Director of Index Investment Strategy at S&P Dow Jones Indices, the S&P 500 is on track for its least volatile year in 22 years. With volatility (or lack thereof) being a favorite discussion topic of market participants, now is a good time to brush up on S&P 500 based factor indices which provide pure exposure to opposing sides of the volatility trade: the S&P 500 Low Volatility Index and the S&P 500 High Beta Index. According to S&P, the S&P 500 Low Volatility Index measures performance of the 100 least volatile stocks in the S&P 500. The index benchmarks low volatility or low variance strategies for the U.S. stock market. Constituents are weighted relative to the inverse of their corresponding volatility, with the least volatile stocks receiving the highest weights. Its counterpart, the S&P 500 High Beta Index, measures the performance of 100 constituents in the S&P 500 that are most sensitive to changes in market returns. The index is designed for investors initiating a bullish strategy or making a directional bet on current markets. Since the methodologies behind both the S&P 500 Low Volatility Index and the S&P 500 High Beta Index do not have any sector restraints or requirements, sectors weightings may shift over time. This can be positive or negative, as the Low Volatility Index may avoid high beta sectors during bear markets, yet may under-allocate to those same sectors during bull markets. The opposite may be true of the S&P 500 High Beta Index. The High Beta Index may play the risk-on trade more effectively, perhaps posting higher than market returns during bull markets. Yet, during bear markets, this index may find itself more concentrated in highly sensitive sectors, which may amplify the pain an investor may experience in a bear market. Over the last decade, more and more single factor, multi-factor, and factor blending strategies have come to the marketplace. 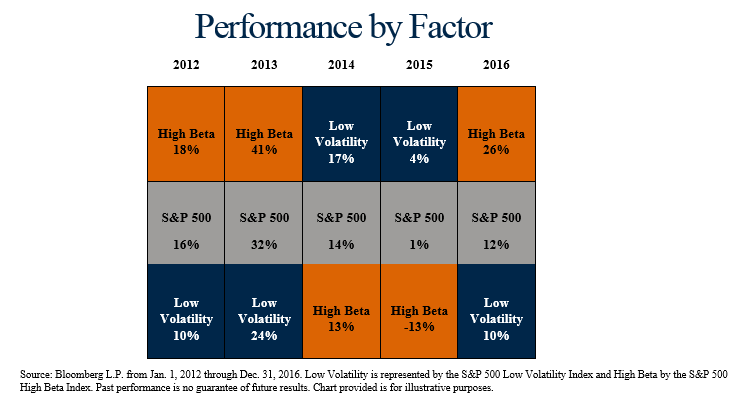 While certain factors, such as low volatility, have consistently exhibited outperformance over long time frames, there are certainly seasons where a given factor will underperform its benchmark. The S&P 500 Low Volatility Index and the S&P 500 High Beta Index are two opposing factors which exhibit periods of high dispersion with one another. 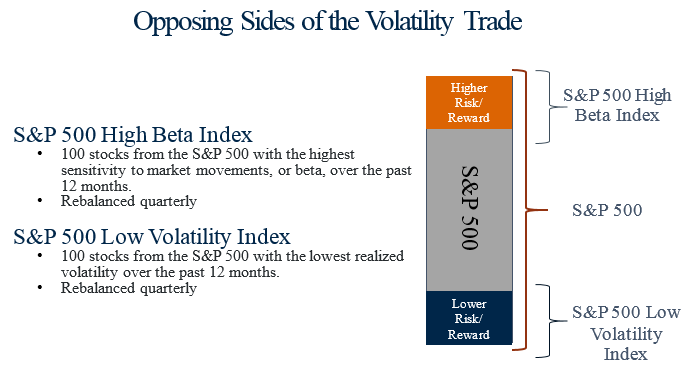 While the low volatility factor has proven to generate market-beating returns across multiple business cycles, investors may want to consider a factor rotation strategy between the S&P 500 High Beta Index and the S&P 500 Low Volatility Index to capitalize on the relatively large performance disparity that exists between the two factors during certain periods.